Quick ParaZap Cleanse, 520 mg 135 caps. 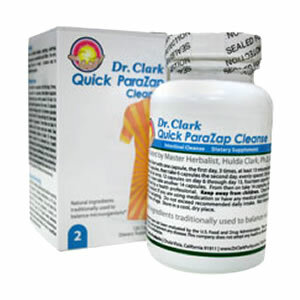 The Dr. Clark Quick ParaZap Cleanse consists of a group of herbs and nutraceuticals that work in a synergistic manner for optimal cleansing. All the ingredients in this cleanse are made in accordance with both cGMP and Dr. Hulda Clark’s protocols. This cleanse supports the body’s natural defenses with compounds that discourage the proliferation of foreign organisms known to occupy the human body, bringing about balance between the body and microorganisms. The herbs in Dr. Clark Quick ParaZap Cleanse have been used traditionally to support normal microbial cleanse function. The whole family- Pets included! Necessity for people returning from abroad. The Dr. Clark Quick ParaZap Cleanse has what Dr. Clark called “systemic" effects. This means it has effects throughout your body. The effects of this cleanse are not primarily in the colon. The colon is greatly aided by the Cloves and Wormwood, whereas the entire body is influenced by the GREEN Black Walnut Hull. A common problem with the Dr. Clark Quick ParaZap Cleanse is that people cannot sleep due to microorganisms releasing uric acid as they are killed off. Dr. Clark taught that Ornithine helps detox uric acid in the body. Ornithine not only helps you sleep, it also gives you vivid dreams. Always take on an empty stomach, at least 13 minutes before a meal, or as directed by a health care professional. Start with one capsule the first day. Notice that you stop from day 13 to17, and then take 14 capsules all at once. This completes your initial cleanse. From then on take 14 capsules once weekly on maintenance basis.